I have a Windows 7 PC on our company network (which is a member of our Active Directory). Everything works fine until I open a VPN connection to a customer's site. When I do connect, I lose network access to shares on the network, including directories such as 'Application Data' that we have a folder redirection policy for. As you can imagine, this makes working on the PC very difficult, as desktop shortcuts stop working, software stops working properly due to having 'Application Data' pulled from under it. Our network is routed (10.58.5.0/24), with other local subnets existing within the scope of 10.58.0.0/16. The remote network is on 192.168.0.0/24. I've tracked the issue down to being DNS related. As soon as I open the VPN tunnel, all my DNS traffic goes via the remote network, which explains the loss of local resources, but my question is, how can I force local DNS queries to go to our local DNS servers rather than our customers? I've not configured the VPN tunnel to use the default gateway at the remote end, and network comms to nodes on both networks are fine. (i.e. I can ping any node on our network or the remote network). I've modified the PPTP connection properties to use the DNS servers 10.58.3.32 followed by 192.168.0.16, yet the query still goes to 192.168.0.16. The local resources that disappear are hosted on domain DFS roots, which might (or might not) be relevant. This only seems to be affecting domain DFS roots. If I reference the share via the server name (i.e. \\server\share instead of \\dfsroot\share), I can access the shares. As per my comment against this answer, I've found I can add the DNS name of the domain to my hosts file which stops my (DFS) network drives from disappearing, but I'd still like the bold part of my question (above) answering if anyone has any ideas. It's not perfect, but just might work. The binding order is stored in the registry in the following location: HKLM\System\CurrentControlSet\Services\Tcpip\Linkage\Bind. The list includes all the device GUIDs for network adapters and active connections in the binding priority order. The result is a key that will support the desired behavior. Every time a VPN connection is established, since the GUID is present, it will not be added. Since the GUID is at the bottom, DNS resolution will be done locally to the client. When the connection is disconnected, one GUID entry will be removed. After 20 VPN connections, the exported registry file can be used to reimport the key. Of course, you can paste the GUID more times to reduce how often you have to reimport the key. 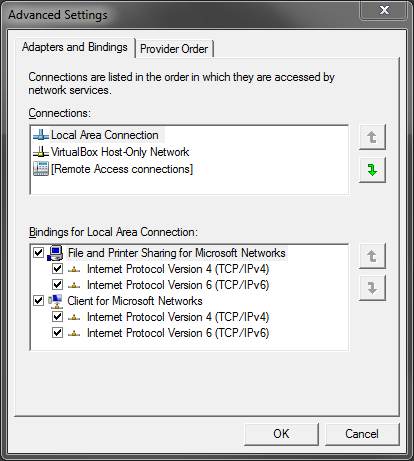 Also important to remember to redo this procedure if there are any changes to network adapters. It seems to me that the VPN tunnel somehow takes precedence over the local area interface directing DNS traffic to the VPN DNS servers (you could check the request on these servers to verify this behavior if you have access to them or someone can verify this behavior for you). That I cannot, entirely, explain since the binding order indicates differently. According to this post here (see the higher scoring answer) Windows has a different perception when it comes to this, choosing a higher priority channel depending on the speed of the connection NOT on the adapter binding order. So for testing's sake try the following to change this automatic behavior: 1) go to Network connections and for each one do 2) IP v4 properties 3) Advanced 4) Disable "Automatic Metric" 5) Manually put a metric of 1 for your local connection and a metric of 2 on your VPN connection (PPP). That way it will sort of hard wire the path to the local DNS servers as preferred over the remote DNS. As stated, this is a split tunneling issue. 1 - Enable split tunneling - insecure and may require work on the client's side. Not likely to happen, IT security gestapo going to shut you down. 2 - Virtualized desktop approach - P2V your existing desktop and turn it into a VM. Use the VM to VPN to the client. You keep your desktop, and can switch into it and out of it as needed. Your VPN tunnel is between the client and the client network. Sounds like it isn't using split tunnelling, which will stop you accessing resources on your own network while the tunnel is up. So you (or your client) need to enable split tunneling, or you need an extra network connection and customised route table to access both networks at the same time. Unfortunately, Windows VPN is not able to do "Split-DNS". You can however remove the DNS Server from the VPN connection after you have connected to the remote site. You HAVE to do this every time you connect to the VPN Network. Though this question was asked long back but posting this answer as this may help others. I had the same issue with VPN where when users used to connect to remote vpn their external dns used to stop for eg. google.com only company domains used to work which were listed on split-dns. Problem was when local machine used do dns query traffic goes to vpn tunnel and if the dns is permitted in tunnel it falls-back. When it fallback it then used to pick ipv6 as resolution first and then never return to ipv4. So to test the results we first disabled the ipv6 on local machine it started working. To permanently fix it for all users we enabled client-bypass-protocol command on ASA firewall which ignored IPv6 if its not configured on vpn pools. so if you can't control the firewall and know the split tunnel and split dns are in place yet it is failing you can try disabling ipv6 on local machine and if you can control it then you can enable above command as long as you dont use ipv6 in your remote network. Yay something I have experience with! Set the VPN connection with the local DNS server and connect to the VPN used nslookup to query the VPN domain name. You should get a response with an IP that is local to the VPN LAN. This means you used the VPN DNS servers to resolve the query. Now open your LAN connection and manually set the DNS to your local or ISP DNS. an Volia!!! use the arrow key and repeat the nslookup query. You will receive a public IP meaning you used your local/ISP DNS server to resolve the query of the VPN domain. Bam!!!! Why do you think its DNS? If you lose access to your network shares when you connect to the VPN - it seems almost certainly like your machine is having difficulty with WINS/NETBIOS. Define a WINS server and test again. Not the answer you're looking for? Browse other questions tagged domain-name-system active-directory windows-7 vpn or ask your own question. How is route automatic metric calculated on Windows 7?